Last week I tried this recipe for the fist time. I made Gnocchi with Zucchini Ribbons and Parsley Brown Butter. I have been trying to get some variety in our lunches, and as always a range of vegetables. Made into healthy and yummy meals for both me and the little man. This was really quick and easy to make, and so delicious! We both wolfed it down. It is so nice to steer away from the usual sandwiches, as you may know I like making healthy, hearty lunches, that my toddler actually eats!! 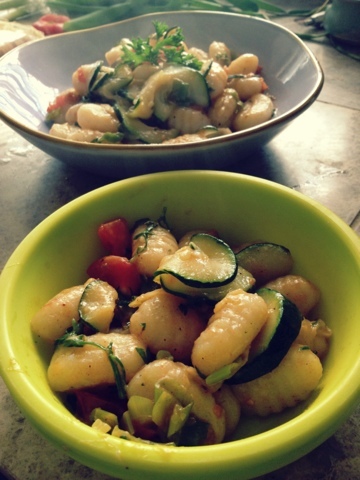 8 comments on "Toddler & Mum Lunch: Gnocchi with Zucchini Ribbons"
I will be trying this one for sure! It looks great! Gnocchi is totally my favourite! I actually have a dish very similar to this on my blog... borrowed from Martha Stewart! You definitely should, after you finish your assignment though!! Oh I will have to check it out! Gnocchi is the best! So easy and the lil man loves his potato products!! So yum, it is going into my regular rotation! !